You know, it’s funny. It could honestly be any day now. According to some websites, a good amount of states have already received their allocations of the Buffalo Trace Antique Collection… but ours has yet to be hit. But tensions are rising. Release information is juicy gossip. Everyone’s got their sources. The bottles are almost here. And nothing is guaranteed. That’s the hardest part. Trevor and I come in to the store on Saturday, November 7th. The place is pretty packed. [David] is behind the counter and [Steve] is in the whiskey aisle. We give [David] the nod as we head down the glorious aisle. [Steve] is happy to see us but he’s talking to a couple. A couple who just grabbed a bottle of Macallan Rare Cask, with a $300 price tag. Interesting. Then as they’re shopping and asking [Steve] more questions, I get caught up talking to a 50 something gentleman telling me about the whiskeys he’s tried. He’s about to grab himself a bottle of Stagg Jr., but he leans to me as says, “It’d be nice to get his big brother”. I say, “That’s a hard bottle to get, you know?” He regretfully agrees. He’s got a sadness to him as he claims that he wanted the Macallan Special Cask. He keeps recalling it leaving before his eyes. I think he’s putting on a show if you ask me. But I digress. I look on the top shelf and see something I haven’t seen in awhile. A box with “Sullivan’s Cove” on it. I almost yell at Trevor as if we might lose our chance to grab it. He grabs it immediately and takes a look at it. Double Cask? We haven’t even heard of that. Their American Oak Single Malt, the bottle we grabbed week one, was extremely rare and extremely delicious. What a find! Soon after, [Steve] gets free and comes over to us as if he’s relieved to speak to us instead of others. 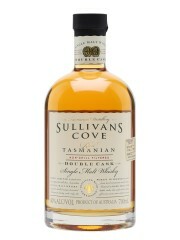 He tells us that the Sullivan’s Cove was a trade that the owner of the store had made with a friend of his. So it was pure luck that we got our hands on it. He pulls out two bottles to show us. One, he just got a case of Smooth Ambler (couldn’t tell you exactly what bottle it was, but [Steve] said it was getting rare) and two, Laphroaig 15 Year Limited Edition. There were five bottles left of the Smooth Ambler and only one of the Laphroaig. 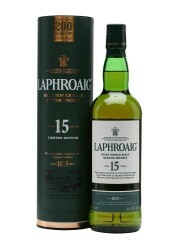 He also mentions how the Laphroaig specifically is in his top three scotches list. So we grab it quick. Meanwhile sad guy is still roaming the aisles. [Steve] meets us at the solo checkout lane. He quickly leans in looks up at the whiskey aisle and whispers with disgust, “I’ve been getting tons of head-hunters in and out of this place”. “I’m glad we’re on the right team,” I tell him. He agrees. It feels good, I gotta tell you, to be on their team. Doing it right. As we’re checking out, we’re about to turn to walk out, [David] hops to our side of the register counter and says straight to us, “Expect a call in the next week or two”. “I know exactly what,” I say. He reassumes his checking out of another customer. We are on top of the world. Thanks for checking us out. Till next time, feel free to check out our Whiskey Reviews – Along The Way section. Or feel free to send us a line in our Contact Us page. Looking forward to the next post. Keep your fingers crossed for us!